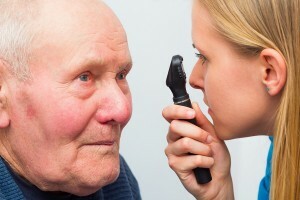 Cataracts are some of the most common conditions to impact seniors today. A cataract is a condition where the lens of the eye starts to become increasingly opaque. When this happens it causes the vision to become blurred or cloudy. According to the National Eye Institute, this condition is so common, that more than half of Americans will have a cataract or will have gone under cataract surgery by the time they reach the age of 80. Cataracts form slowly and over time they will start to serious impact a senior’s eyesight. This clouded vision can make everyday tasks difficult for seniors from driving to reading. Seniors may not only report clouded vision but may state that they are seeing halos around lights or fading or yellowing colors. As a caregiver it can be very difficult to provide care for someone with cataracts. Not only do most people with cataracts struggle to drive, but they may also be unable to do their favorite activities such as sewing, writing or crosswords. With this in mind, here are a few tips for senior caregivers on how to care for loved one with this common visual ailment. Make sure your loved one is getting an exam every two years, once they reach the age of 60. This is important even in seniors who don’t have cataracts, as the earlier you can get a diagnosis the better. Take your loved one into the eye doctor at least every two years if they have cataracts as well as contact lenses or glasses. Adjust the lens strength or shape can greatly help those with vision limitations caused by cataracts. Make sure your loved one is getting regular medical checkups. Many times cataracts are actually a side effect from other illnesses, such as steroid use or diabetes, so other areas of health need to be examined as well. Restrict your loved one’s driving, especially at night, even if they are resistant to it. Make sure your loved one is always wearing UV-protective sunglasses when out in the sunlight as extended sun exposure is often linked to eye damage and to cataracts. Keep your loved one as healthy as possible. Obesity can actually increase a senior’s chances of having cataracts, so the healthier their weight and the healthier their diet, the better. Create a clear path inside the home for your loved one. Cataracts can make it difficult to see objects or clutter that may accidentally cause your loved one to fall and hurt themselves. While caring for a loved one with cataracts can be difficult, the good news is, there are surgeries that can help seniors restore their vision. While not every senior is eligible for this surgery, it may be an option, once you consult with your loved one’s doctor about this procedure.